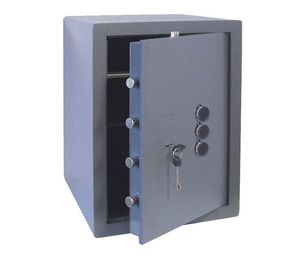 A safe is a sealed container made of reinforced metal or another material for the safeguard of valuables. Sizes and models vary, including freestanding and built-in types. Some are waterproof or fireproof to protect contents against flood or fire damage. Size and access system may vary, depending on home or professional use. Security level depends primarily on type of access, which can be by one or a combination of the following systems. - Key access may require a single key or two used simultaneously. - Mechanical safes require turning one or more combination dials to open the door. - Electronic safes have a keypad for entering the combination or code. - Biometric safes open when their scanning device recognizes the fingerprint of an authorized user. Choice will depend on the size and quantity of objects to be stored, the level of security and opening system of the safe.